Learn valuable tips on how to effectively produce, publish and maintain a news blog. Get James Schramko's secrets to creating a powerful news blog. Hi this is James Schramko and I’ve just run a SilverCircle intensive workshop here at the lab and it was number 4 and I want to give you some highlights that you can implement into your business, right now. It was a great day and we went through all of this stuff. 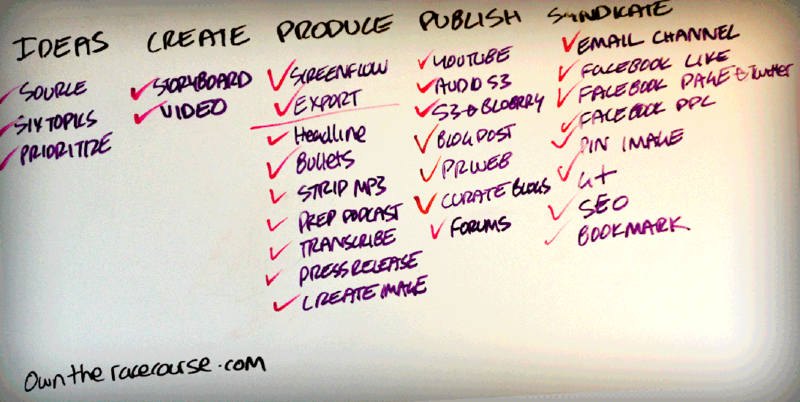 I mean it took a whole day to go through the things that are on this whiteboard but I’m going to give you some highlights. # 1 The point of my entire system here is to streamline everything. It looks kind of complex when you put it up on the whiteboard but once you have a system, then it’s like putting out train tracks in front of the train. You just roll that train along and everything works smoothly. So huge amount of effort to lay down the sleepers, clear the land, put the tracks on and nail them all in but once you’ve done it, you have a system and it provides you with that straight line path. That’s what we did, we laid down the tracks and then the locomotive’s ready to roll down it. You should have a streamlined system in your business. One of the ways that my system works so well is that it is news based. News means that you’ve got the permission to keep contacting your best customers, your current customers, your pre-customers and your post-customers with updates about what’s happening and what’s changed. The one thing we can be certain of in business is that things will change so a news framework actually helps you get a nice permission based email marketing system. Of course if you are connecting with people in multiple places, which is one of the benefits of a system like this. You will be able to reach people on Facebook, YouTube and iTunes. They’ll keep logging in to see what’s new. More than half the traffic to my SuperFastBusiness.com site is repeat visits and that’s a good thing. That’s like a super high level CRM system. Another important aspect is to segment your business into channels. You want to have the most relevant conversation with the right person at the right time. If you have one product, you’ll still have different categories of buyers. You just need to segment them out into separate channels and then create those as categories on your website, categories in your Evernote where you collect ideas and categories in your email segmentation so that you can always have a relevant conversation. You also will need a routine. It’s just like the train analogy, the train goes to a schedule, it happens all the time, people know this happens so they turn up and get on the train and the train moves, that’s what will happen with your customers. You send out a weekly newsletter, you will get the weekly customer interaction. Set schedules and routines for yourself and for you customers. I use iCal to actually alert me when something’s happening. One of the other great things about this system is that you can be completely independent of any single platform. You’re not building your business on Facebook, you’re not building your business on YouTube, you’re building on your own website and you’re building your own database which is transferrable, portable and controllable. When people change the game, you just substitute them out and bring something else in. It’s important that you “Own the Racecourse”. This really is a system where you are in control. It’s also important to do things in small batch sizes. There’s a reason why these videos are short. It’s easy to do small pieces of content. It’s easy for each person in your team to do one small task and complete it and get that satisfaction of accomplishment. There’s a reason why people open emails that are short and have a very short video or audio message for them because they can consume it. Bite size chunks is the way to go. And almost everyone will sit through a 1 – 2 – 3 minute video but they won’t sit through 7 – 8 – 9 – 10 – 15 or 20. When you go to iTunes have a look at the movie trailers. You’ll see how short they are. Most of them are done within 30 seconds. You’ve heard me mention team. Most likely you’ll need a few people to help you with a system like this. This is a comprehensive system but this system here feeds a couple of million dollars’ worth of chocolate wheel. Pull people towards the system through our marketing content creation and syndication processes. This is a big powerful machine and with just a couple of people you can make something really special from it. It’s important to have checklist until this becomes completely habit driven. I use checklists in fact this board here I’ve turned into a checklist for the SilverCircle attendees. They can now just tick, tick, tick. All of these trainings are included within SuperFastBusiness. There are the Content Assault modules on how to get ideas and create and produce content. There are the Traffic Grab modules on how to syndicate that content. There are the measurement modules at SuperFastConversions, shows you how to tell if your stuff’s actually working or not. So if you were to put all those blocks together you’ll end up with this big system, which is kind of my “Own the Racecourse” system. Most importantly, this will build your customer list the way that its setup, it builds your customer list. I encourage you to dig into the individual components that make this system which are Content Assault, Traffic Grab, and SuperFastConversions. Put them all together, you have the system. 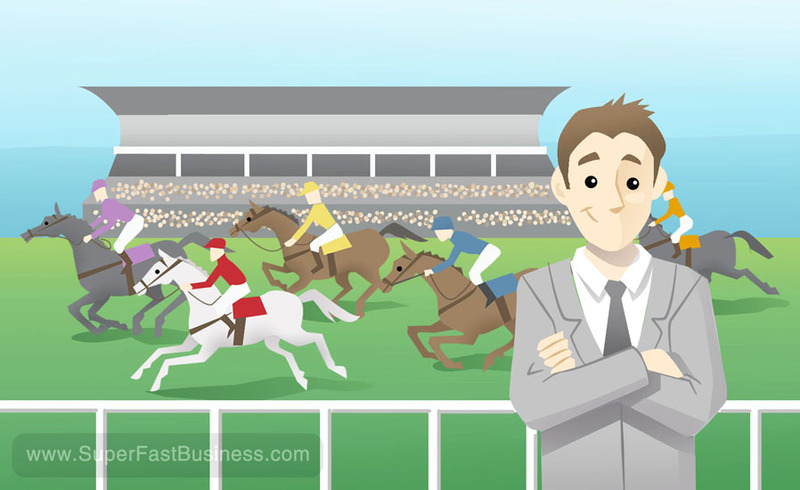 Use the “Own the Racecourse” checklist that accompanies this video because that is going to give you the step by step run through of what you need to do to get this to work for you. Just dry ice – to remove a sun spot. Its 2:19 am here and guess what … i am watching traffic garb videos since last 6 hrs. About to finish watching all. Press releases had blown me away. Cant wait to implement this. That was right to the heart! As always to the point. Thanks James. I will be digging into the three modules mentioned. I have a confortable/soldid team behind me now…laying the tracks next…very good vid! Thanks again. Sounds like a plan Nam! hi, really interesting post, especially in terms of how I can make my blogs really engaging.